Skills and Abilities: Trained armed and unarmed combatant. Powers: His power is the ability to create perfect copies of himself. One of the worlds very first activated Psiots and the original right hand man of Toyo Harada when he first founded the Harbinger foundation. Alongside Griffon they were Harada’s very first strike force [Harbinger #11]. He was present when they failed to activate a former soldier into a psiot. He was at Toyo’s side when they made an alliance with Rising Spirit Securities. When information leaked from Harbinger to Rising Spirit he carried out the investigation and aided Harada in dealing with the traitors [Harbinger #12]. He was completely loyal to Harada and accompanied him in his war against project Rising Spirit though he often dream’t of using his powers to aid the civil right movement. 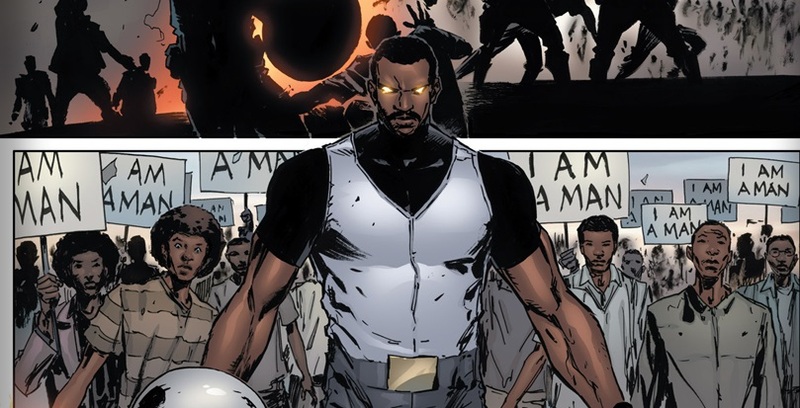 When the battle broke out he quickly cut through the resistance with his powers [Harbinger #13]. Once they located Crater the leader of Rising Spirit he revealed that he was a high order telepathic Psiot. He took control of Hunter and had him kill Griffin. Hunter pleaded with Harada to kill him. Harada lashed out with his powers and destroyed his friend in mercy. Years later when Harada returned to rebuild the Harbinger Foundation alongside the spirit of Griffin they wished their friend goodbye [Harbinger #14].